How to earn without having a website? Earn some extra bucks by just hanging out in Facebook, is this possible? 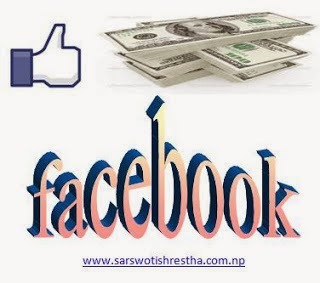 Earning online is the best option to have some extra income and in this post I am going to inform you how you can earn from Facebook. Many people are interested in Facebook and spend their plenty of time hanging out in Facebook but they usually don’t know that they can earn enough bucks from Facebook. Facebook is not only for chatting or making friend but it is also for business and may be you don’t believe that many international companies are promoting their sells from Facebook and its features of creating pages had incredibly supported the online business. Now let us talk how you can earn or possibly promote your online business. It is all simple. Facebook unique features like making status updates, photos, notes, creating pages and so on indeed helped in promoting our business. You can probably use your own Facebook account as the online store to sell the products or you can have some affiliate link to promote product and use them through Facebook for promoting. Many people today are promoting their products through Facebook so why don’t you try it? I guarantee that you’ll succeed. Once you have a clear vision in online earning through Facebook then I bet you’ll not suffer any problem to earn money through Facebook. So what are some tips to earn online through Facebook? Basically create Facebook page and make sure you keep the name of page according to your product because it is very much important then after having a Facebook page you can share the news related to your product with the world. Just add some interesting features of your products. Well in online you need to be creative and include such contents that are liked by the people like humor, facts, entertainment, amazing, attention seeking elements will make your sale go higher. Make sure more people reach to your products furthermore, you can use Facebook promotion features that helps to take your product to more people by simply giving some bucks to Facebook minimum amount start from $10 I guess. Well while promoting your own product or your affiliate product makes sure you have a awesome reach to more people. Well another way of making money through Facebook is help the huge multinational companies like Coca-Cola and many others in keeping their Facebook page update. You can Google it and have some companies or websites that provide you the opportunity to update the Facebook pages of such multinational companies. They pay you suitable amount just for helping them in the promotion of their product. So Facebook is not only the way of enjoying but it can be also the way of earning. Just you need a good direction and coordination with what you do. Keep on searching the way to earn and once you get it. It does not matter how long it takes to you to earn online but you need money right you keep on attempting and you will succeed. Want to make money online? Visit the below link to learn how can make $40-$50 a day so easily with a much little effort.